I am thrilled to be joining the TexPTS team as we expand into the south side of San Antonio. The City Base clinic presents a wonderful opportunity to further spread evidence-based physical therapy ... I look forward to seeing how my community benefits. 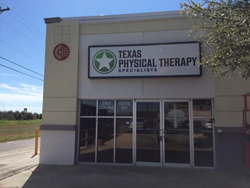 Texas Physical Therapy Specialists (TexPTS) is proud to announce the opening of its newest clinic in the south side of San Antonio, Texas on March 1, 2016. The clinic can be found at 2902 Goliad Road, Suite 101 near City Base and offers appointments as early at 7 A.M. and as late as 7 P.M.
“I am thrilled to be joining the TexPTS team as we expand into the south side of San Antonio. The City Base clinic presents a wonderful opportunity to further spread evidence-based physical therapy across San Antonio and I look forward to seeing how my community benefits,” says Dr. Chris Maldonado, PT, City Base Clinic Director. The new clinic is the 20th location for Texas Physical Therapy Specialists, continuing the growth of a company that is a prominent leader in the physical therapy industry. It is the fifth clinic in San Antonio, joining locations in Northwest (inside the UIW PT school), Selma/Schertz, Stone Oak, and Westover Hills. Staff members employed at the clinic, including Dr. Maldonado, are fluent in Spanish. For more information about the new clinic, as well as a full list of TexPTS’ services and offerings, please visit TexPTS.com. To book an appointment with one of City Base’s experts in musculoskeletal care, please call 210.904.0440. Founded in 2004, Texas Physical Therapy Specialists (TexPTS) is a private physical therapy practice with locations throughout the following areas: Austin, Cibolo, Central Texas, Dallas, Georgetown, Hill County, Liberty Hill, Live Oak, Randolph Air Force Base, New Braunfels, Parmer/Pflugerville, Round Rock, San Antonio, San Marcos, Schertz, Selma, Spring Branch, and Universal City. Known for teaching and training physical therapists all over the US, TexPTS physical therapists take pride in delivering comprehensive and compassionate care to their patients with the best results. Our clinicians have a have a wide range of clinical expertise in manual physical therapy, spine care and rehabilitation, general orthopaedic conditions and rehabilitation, sports specific injuries, workplace injuries and much more. TexPTS is the official physical therapy provider of Univeristy of Texas at San Antonio Athletics. They were also voted one of the Top 50 Places to Work in San Antonio in 2011, 2013, and 2014 by their own employees, the Best Private Physical Therapy Practice in the U.S. in 2009 by their peers in the American Physical Therapy Association and has been recognized on the Inc. 500/5000 lists for the past three years. For more information visit TexPTS.com or the TexPTS Facebook page. Check out more details about TexPTS' City Base Clinic!